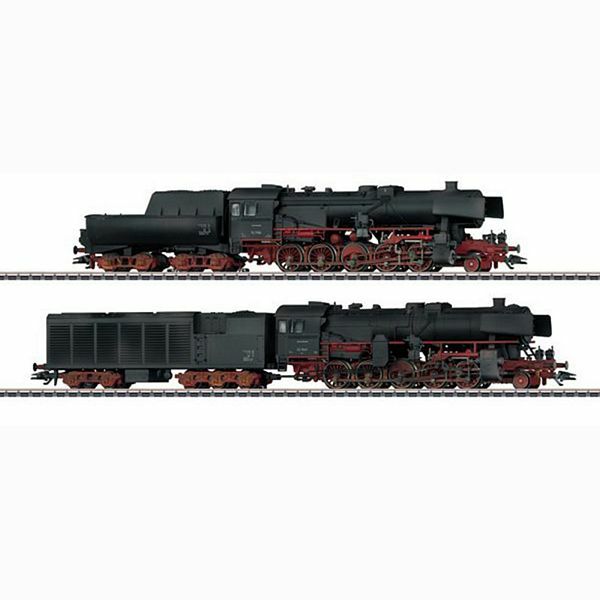 Prototype: 2 German Federal Railroad (DB) class 52 steam locomotives. One version with a tub-style tender and one version with a condensation tender. Authentic weathering. The locomotives look as they did in the Fifties. Model: Both locomotives have mfx digital decoders and extensive sound functions. They also have controlled high-efficiency propulsion. 5 axles powered on each locomotive. Traction tires. The locomotives have articulated frames to enable them to negotiate sharp curves. The dual headlights on each locomotive change over with the direction of travel, will work in conventional operation, and can be controlled digitally. The 7226 smoke unit can be installed in the locomotives. Piston rod protection sleeves can be installed on the locomotives. Length over the buffers for the locomotive with a tub-style tender approximately 26.3 cm / 10-3/8" and for the locomotive with a condensation tender approximately 31.5 cm / 12-3/8".